Built in Germany just before the outbreak of WWII, M.S. Mouette is a purpose-built steel diesel motor boat which was commissioned as a passenger ferry for service on the Swiss lakes and was in service for approximately 60 years. Now fully restored and retaining most of its original features, M.S. Mouette occupies a prominent mooring on Cadogan Pier, Chelsea Embankment. Currently used as a pied a terre, the vessel offers approximately 1380 sq ft of gross internal area with a further approximately 700 sq ft of external recreational decks. There is one bedroom, one bathroom and plenty of interior and exterior entertaining space. There is an also additional storage facility in the hold. 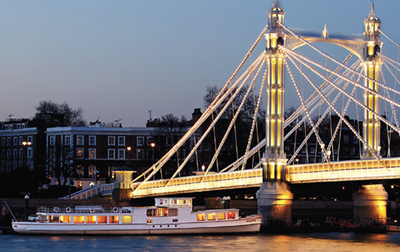 Cadogan Pier is accessed via a gated entrance on Chelsea embankment and is operated by the London Tideway Harbour Company Ltd. The guide price is £1m. For further information please contact Harrods Estates on +44 20 7225 6509 or visit www.harrodsestates.com.